To live a life with direction and purpose one has to set goals. It is not good enough to take a couple of steps which will one day ultimately lead to a goal, but every single step and decision you make will need to be a goal itself. Small goals & baby steps ultimately lead to long term achievements. As a health, nutrition, fitness and wellness coach I frequently get approached by various kinds of people with completely unique goals, seeking my assistance in helping to achieve them. Goals that I often see are weight loss goals, sports or athletic achievements, general health whether for a family or individuals and even some whose goals have completely shifted due to illness or injury where I assist in getting them back on track. Reviewing a goal that anyone sets requires an element of responsibility and I don’t always agree to assist a person in achieving their goal. I need to review the goal, review current health & lifestyle status and then decide if the goal they are aiming for is realistic. I can honestly say that more than 90% of the time, the goals are completely unrealistic. Not in the sense that they are not achievable but in the sense that they are just not realistic to do in that space of time. 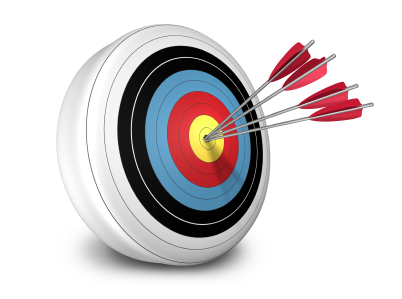 The general person aims extremely high, and if you understand archery you know that aiming to high causes you to miss your target, of course in the same token if you are aiming to low that’s also not good. If you are aiming to high you are not only setting yourself up for disappointment but potentially ill health depending on what that goal might me. Let me enlighten you a little more, and then it will make it easier for you to follow ;-). A person that has spent the last 10years eating unhealthily and completely letting themselves go cannot realistically expect to turn those 10 years around in 6 months it’s just not going to happen. That kind of a goal is something that does not have an end, it’s a lifetime of consistency and smaller weight and health goals on route to ultimately help achieve the long term goal with complete sustainability and good health. Another example is the amount of people that approach me and say “I want to do Ironman next year”. Well that’s all well and fine, then my next question is “have you ever done a triathlon before?” and the answer in short is no or yes a sprint distance. Wow so in 12 months a person who has never trained for an ultra-triathlon suddenly wants to do an Ironman. No chance, not on my watch. It’s not that I don’t want them to achieve it. It’s more the point that this is an event just like an ultra-marathon that puts a lot of stress on the body, not the event itself but the entire volume and intensity of training leading up to the event. I was once doing an ultra-distance triathlon overseas, and a woman approached me the night after that race while I was standing at the entrance of the athlete’s hotel. She asked what the event was and I explained to her. She then asked me if I thought that such an event was “healthy” surely no she insisted. My answer was pretty clear, in agreeing that for most of the people the event is by no means healthy, however for some it’s absolutely fine. The two groups of athletes I am speaking about are clearly defined. There are those that have in a utopic world have been active their entire lives and over many years have built up endurance slowly and properly over a decent period of time, watching their nutrition, health and pretty much leading a healthy lifestyle consistently. An event like this is hard, but their bodies well equipped & serviced to handle the journey. The second type of athlete is the kind that has gone out on a whim decision to fast-track himself into an endurance event which he mentally might think he is ready for but his body definitely is not yet his mind will drive him through thick and thin to get him to the finish line. This is the high risk individual the one that does the damage, the one that will go beyond his capabilities achieve, achieve some more, but then eventually it all caves in and believe me it actually does, illness injury, emotionally, it’s way too much too soon and life is not a 10 or 20yr period, its life. Most of these kinds of athletes are around 20-40yrs old, the problem is they are not looking to 50, 60 and beyond. It’s when I analyze these individuals I need to reshape their goals, explain the risks and if they insist I would rather turn them away then play a role in their ultimate demise. I am not interested in taking on an individual for the sake of it, I need to know that the path I am guiding them down is one of health, comfort and achievability. The same goes for a person who is a carbohydrate junky and in one day he switches to a LCFH (Low Carb High Fat) diet. Good luck, thousands succeed, but it was not a success overnight it was a process. Goal setting really requires thought and wisdom, not irrationality and compulsion. It’s an element of life that has no quick fixes. It’s a process that guides our short term decisions in long term achievements and it’s a crucial driver for happiness, fulfillment and accomplishment. Remember to aim that arrow well, don’t just look at the target but assess the wind direction and speed, stay steady in the pull and release with intended purpose.